I would give you a resounding answer of the Total War series developed by The Creative Assembly. I have always loved this series. I remember playing Medieval Total War when I was much younger and being sucked in; I would play for hours, dedicating huge amounts of time to developing little plans and schemes. Having played and loved each game in the series, upon the release of Napoleon Total War I felt the series took a bit of a dive. It was the little changes that made it more difficult for me to enjoy the new games, and, as a result, Napoleon Total War felt like it would have served better as downloadable content for Empire rather than being a game in its own right. In addition, the format change to a more linear campaign made the game feel unfamiliarly restrictive. 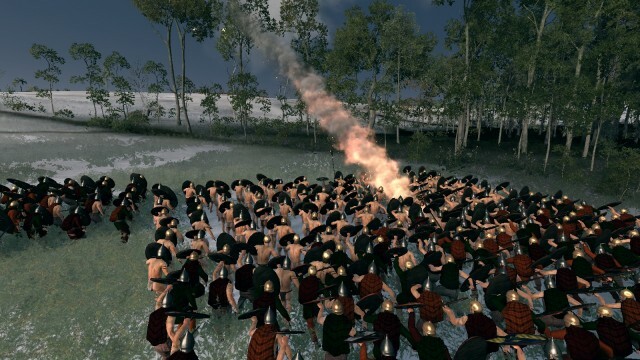 After such disappointment, I hoped Total War: Rome II would bring back that spark, that joy de vive I miss so much. Has it succeeded? Well, let’s discuss the experience I had in the fifty hours I played. 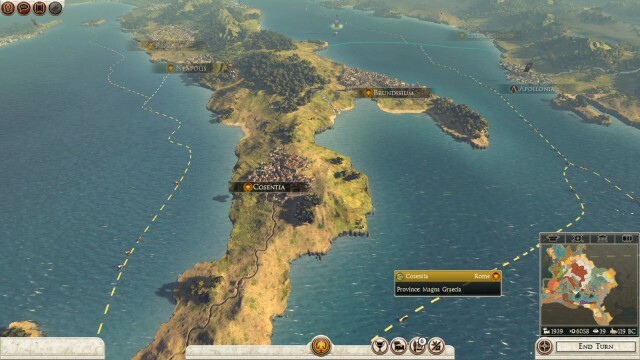 Total War: Rome II begins with the heavy hint that for ultimate immersion you should play the prologue. In this you play as a generic Roman military leader who is given a few orders such as sieging Capua and invading the Sammites. The prologue really does show you a lot of the game from the first few mock battles and campaign tutorials; I found myself immediately engrossed as I watched my men fight for their lives and heard my officers shout for the glory of Rome. The introduction of new tools to the game really do help the player; firstly there are strategy maps which allow you to see a representation of your battle within a war room feel. Another of the new tools is the action camera which, when clicked in battle, shows the fight from your point-of-view. This really lets you immerse yourself in the struggle whilst highlighting the graphical capabilities of this game. At one point in the game, my small force of Rome’s finest were defending against a force of 3000 hairy people with a strong dislike for my foreign policy. In another moment of peril, my leader’s unit was cut off and faced onslaught from hundreds of people who resembled Colin Farrell had he been stuck in a wind tunnel for eight days with nothing to drink but White Lightning. 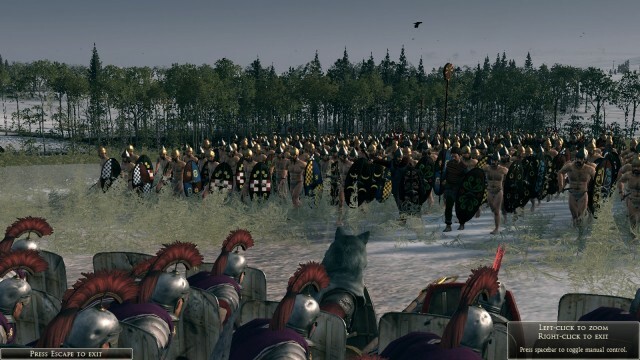 The action camera is a great feature of Total War: Rome II, and the epic battles are fun to watch. I can simply click the action camera, sit back and relax as I watch my men fighting together, back to back slashing, ducking and weaving; at one point I swear one of my men nobly pulled the leader out of the way of a falling blade. It was just beautiful to watch. The game’s beauty is emphasised by the fact that the graphics are incredible. 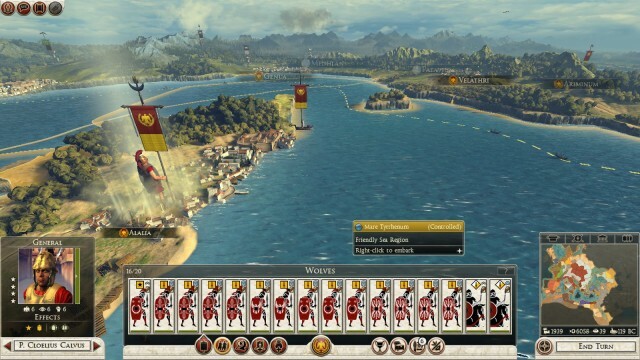 From the stern-faced soldiers to glimmering water, Total War: Rome II is stunning to look at. Long gone are the days of two identical men stabbing the air around them. Thankfully! Even the campaign map looks well-made and admirable. The sound however is a different story. Whilst sounds on the battlefield are well judged with dramatic music and superb sound effects, the campaign music is akin to having Greco Roman themed elevator music. After listening for even a short amount of time to its repetitive drones and squeals, I had to turn it off. Similarly annoying are the alerts and notifications sounds which repeatedly made the irritating noises. This was compounded by the fact there were not many options to change the music; the game only allows the volume to be either on or off. This is why I’m a little bit mixed up about the game as the things it does are great while the negative features make the game half unplayable. For one the AI is as mad as box of ferrets. In one instance I was five turns into a new campaign when sixteen inaccessible countries declared war on me. Things like this would happen a lot, making diplomacy impossible. I would agree with a small state to not attack them and offer trade and financial help in return for doing the same. They agreed for 5 turns before sending me an offer of an alliance. Two turns into that alliance an invasion fleet lands. This isn’t complex strategy that’s rolling dice on diplomacy. This is combined with limited development of cities. Instead of being able to add new buildings as before you are limited to a maximum six spaces and can upgrade those buildings. This would work for provinces but when Rome cannot have an armoury due to space, I take a step back and say hang on. Things like this make the game a real slog at times. While before I would gleefully role over turns planning and waiting for my move. I was now clicking waiting for something to happen so that I could react. Managing Rome and its empire became tiresome and dull. More and more I was sitting with a full army waiting to invade somewhere but couldn’t until I had cleaned my room, I mean set up my diplomatic relations with neighbouring states. I’m not a warlord but I don’t play total war games so I can discuss with nations the finer points of the wine trade. This is why I hate to admit but I’m not the biggest fan of Total War: Rome II, oh I will play it again I’m sure but not in the same way I replayed the others. Instead of watching the hours drift away, you find yourself having the best time in the world one second and then spending 40 minutes hoping it will happen again. Playing it is like searching for croutons in a bland salad, no matter how good the crouton is you still have to go back to munching leaves. + Battles are amazing to behold and be a part of. + It’s still a Total War game at heart. + New features like the action camera. – Too slow, even for a grand strategy game. – AI is less playing chess and more random action generator.